The Young and the Restless Spoilers: Vickie Shows Compassion for J.T. – Was He a Monster or a Troubled Human? 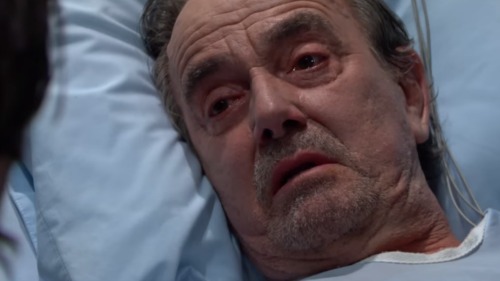 The Young and the Restless spoilers documented the incredible storyline that painfully showed what can happen to a human being who spins out of control. But despite all that happened with J.T. (Thad Luckinbill), Vickie (Amelia Heinle) evidenced compassion regarding the tragic event that happened. This plot line weaved elements of real life events with creative soap opera embellishment. Do adults descend into madness, thereby seemingly changing before their loved one’s eyes? Sure, addiction, the onset of mental illness and other factors provoke personality alterations across the world. But was it reasonable to believe that J.T’s grudge against Victor (Eric Braeden) for being complicit in Colleen’s (Tammin Sursok) death and his supposed career troubles led him to become a monster? Yes, it was reasonable, but became a stretch within what was an obviously rushed storyline. Luckinbill’s surprise return to Y&R’s cast late last year began a four-month mini-arc that saw his once-normal character written into a one-dimensional male-monster. That played to cartoonish beliefs about men in society. Where are the strong male characters on this show by the way? Think about that point for a minute, or a month as continued episodes are projected. Meanwhile, blood lust was being encouraged by others within Genoa City. In the immediate aftermath of Nikki’s (Melody Thomas Scott) head-conk and the subsequent body-drop, there was no compassion being offered for Mr. Hellstrom. In keeping with B-movie horror shows, this Dracula character merely needed to be disposed of. In keeping with her sensitive and honest nature, Vickie reminded the members of her cleanup crew that she loved J.T. and that he was Reed’s (Tristan Lake Leabu) father. Whoever, or however many pushed for those lines of dialogue within Y&R’s writer’s room are given a common sense award. Of course there are loved ones who choose to remain blind to glaring issues and then face unjust consequences, or become targets as Vickie did. Surely this storyline will help various viewers to recognize others flaws, or the flaws in themselves. No one who claims to be for justice would ever propose that only the J.T.’s of the world are able to lose control. The Vickie’s can do so too. Yes, this storyline should serve to remind everyone, or to open their eyes to the potential that anyone can come to need serious mental health care. Unless Y&R has J.T. rise from his grave, after having been in some sort of alien resting state, fans have likely seen the last of Luckinbill. He could always return again as J.T.’s unknown twin brother, or in a dream sequence. But if this is the last viewers have seen of this solid actor, their memories will hopefully rest on his character’s better days that occurred in the first decade of this millennium.